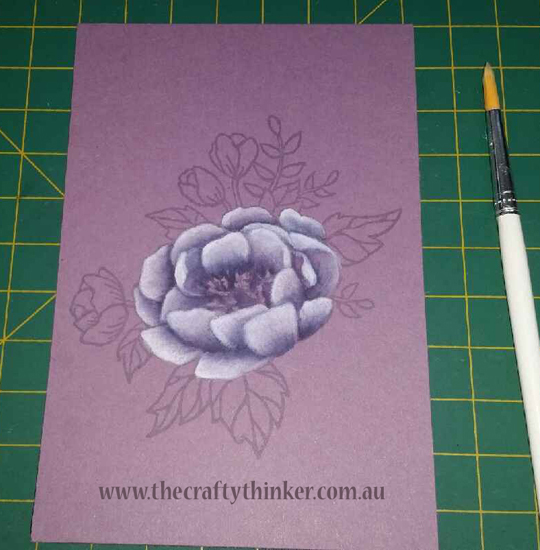 The other day I was very happy with the result when I combined the beautiful Birthday Blooms stamp with pastel pencils and decided to try for a similar effect with watercolouring. Whilst I still prefer my original version, I'm not too unhappy with this for my first attempt and I'll probably try it again having learned from my mistakes! 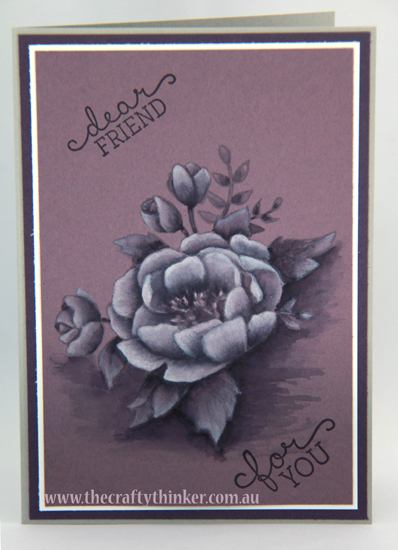 I stamped the flower onto Perfect Plum cardstock with Wisteria wonder ink to provide pale outlines. I coloured using Elegant Eggplant and Craft White inks, water and a fine paintbrush. Having experimented a bit, I decided that I found it better to paint with the Elegant Eggplant first and add the white later. I also found that the white goes a very long way! While I coloured, I was constantly comparing tones and contrasts - darkening shadows where necessary and adding more highlight from time to time. I left some parts of the image uninked and used the colour of the cardstock as my third colour - but not as much as I would have preferred. It was my intention to work evenly across the whole image but that didn't last long! Had I persevered, I would probably have achieved a better result but my poor little brain wasn't coping - so I found it easier to work on one little area at a time. I added the shadows and foreground last - although that did present a challenge to get the shadow deep enough! I had meant to take photos as I worked but only remembered at this stage! I stamped the greetings after I'd completed all the watercolouring (and it was dry) to preserve the crispness of the lettering. I adhered this panel to a layer of Whisper White cardstock and then onto the Elegant Eggplant card. If you click on the product images below, you will go direct to my online store.